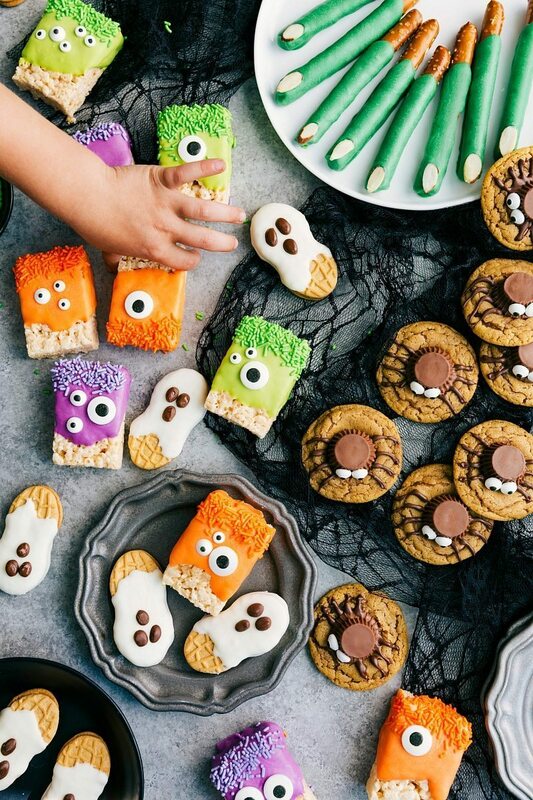 3-ingredients to make these adorable (and delicious) Halloween treats — Monster Rice Krispies Treats, Peanut Butter Spider Cookies, Nutter Butter Ghosts, and Witch Finger Pretzels. 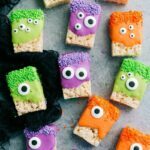 These Monster Halloween Treats have a lot of different options and while they can certainly be more than 3-ingredients, you can definitely go the “minimalist” route and make some cute monster treats with only 3 ingredients. I chose to use a variety of colored candy melts and ended up using about 1/3rd of each (12 ounce) bag of chocolate. If you do just one color, you’ll use just about the entire bag coating the tops of the Krispie treats. You can also use an assortment of eye candies or just one shape/size. Add the candy melts (if using one color, separate it into 3 parts and if using different colors, place about 1/3 of each color) into microwave safe bowl(s). Microwave (one bowl at a time) of candy melts in bursts of 20 seconds, stirring vigorously in between each burst for 10 seconds. Meanwhile, upwrap the krispies treats. Once the chocolate is smooth, dip the krispie treats in the melted chocolate and then use a spoon to help spread it over the treat. You want it to be a bit ragged to look more like a monster. Working quickly (the melted candy melts harden fast), add candy eyeballs (however you want and whatever size you like) and if desired, colored sprinkles. Transfer to the prepared sheet pan and allow for the chocolate to set at room temperature. These are best enjoyed the same day they are made. 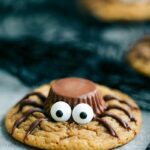 These spider cookies are super tasty, simple, and fun! Again, you can make these with three-ingredients, or use a few more ingredients. To stay true to 3-ingredients, I use refrigerated peanut butter cookie dough, which is delicious, but you can also use your favorite peanut butter cookie dough recipe. If you use a different recipe, avoid pressing down the center with the tines of the fork. The eyeball candies add an extra ingredient, but they’re totally optional. The cookies are still super cute (and delicious) without the eyeballs. 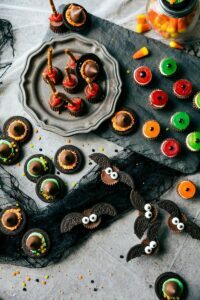 You could also use chocolate chips or piped chocolate in place of the eyeball candies. Prepare the cookies according to package directions. Remove from the oven and transfer the cookies to a cooling rack to slightly cool. Unwrap the peanut butter cups and then gently press in the center of the cookies. Let harden. Microwave in bursts of 15 seconds stirring in between each burst for 10 seconds until the chocolate is melted and smooth. Transfer the melted chocolate to a plastic bag and cut off the very tip of the bag. 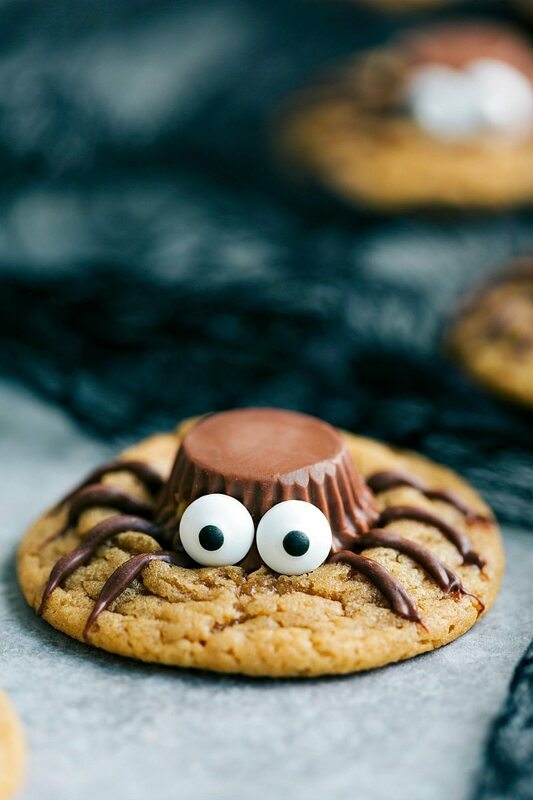 Pipe "spider legs" onto the cookie starting from the Reese's cup going outwards. If desired, pipe a little melted chocolate on the back of the edible eye candies and press into the Reese's cup. 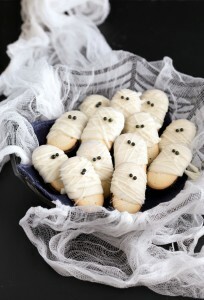 A few years ago, I made these Mummy Cookies using Milanos. We make them every year and sometimes I switch up the Milanos to use Nutter Butters! I thought it would be fun this year to make a few different versions, and Ghosts were the first thing that came to mind. 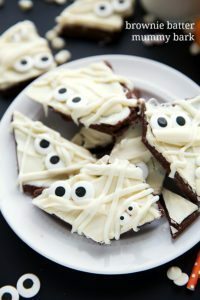 With pretty much the same ingredients you can make these ghosts AND the mummies at the same time. 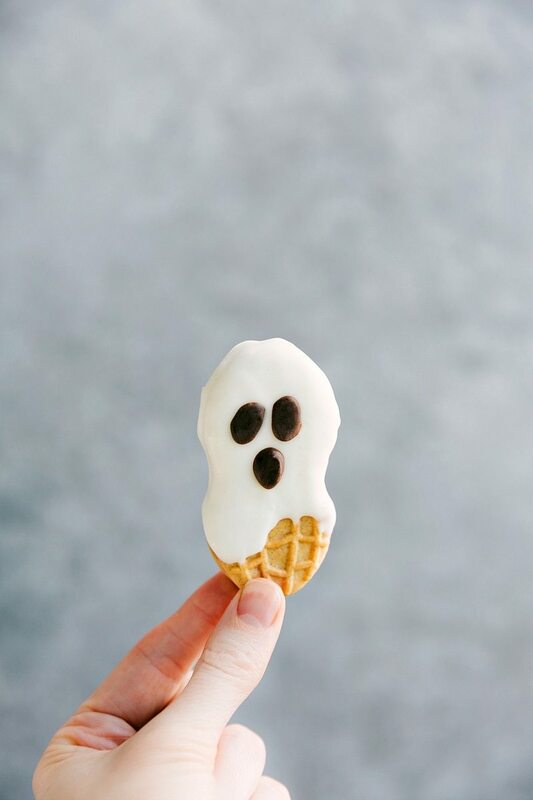 Instead of melting chocolate for the ghost eyeballs/mouth, you could also use un-melted chocolate chips. Separate the white chocolate into 3 microwave-safe bowls (makes for easier melting) and add 1/2 teaspoon vegetable oil or shortening into each part. (Not essential, but makes it easier to coat the cookies). Melt one part of chocolate at a time. Place it in the microwave and microwave for bursts of 15 seconds stirring in between each burst for 10 seconds until the chocolate is melted and smooth. Dip the Nutter Butter cookies into the melted white chocolate and use a spoon, to spoon it into a ragged shape near the bottom of the cookie. Shake and tap the cookie to remove excess chocolate and to smooth it. Transfer the dipped cookies to the prepared sheet pan and allow to completely set. Once set, melt the milk chocolate in the microwave. Transfer the melted milk chocolate into a plastic bag and cut off the tip. Pipe eyeballs and a mouth on the cookies. Let harden. Best eaten within 1-2 days. These slightly creepy fingers are too much fun to NOT make 🙂 For a different variation, you could use lime green candy melts instead of the dark candy melts I used. You could also dye the almonds black with black gel coloring (See here!). However you make them they go great with these adorable Witch Oreo Truffles! Separate the green chocolate candy melts into 3 microwave-safe bowls (makes for easier melting) and add 1/2 teaspoon vegetable oil or shortening into each part. (Not essential, but makes it easier to coat the pretzels). Melt one part of the chocolate at a time. 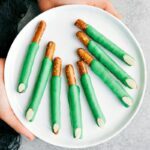 Place it in the microwave and microwave for bursts of 15 seconds stirring in between each burst for 10 seconds until the green chocolate is melted and smooth. Dip the ragged end (from breaking) of the pretzel into the melted chocolate and dip about 3/4ths the way down. Use a spoon to help guide the chocolate and cover the amount you want. Tap and shake the pretzel to smooth the chocolate and remove excess. Place the chocolate on the prepared sheet pan. 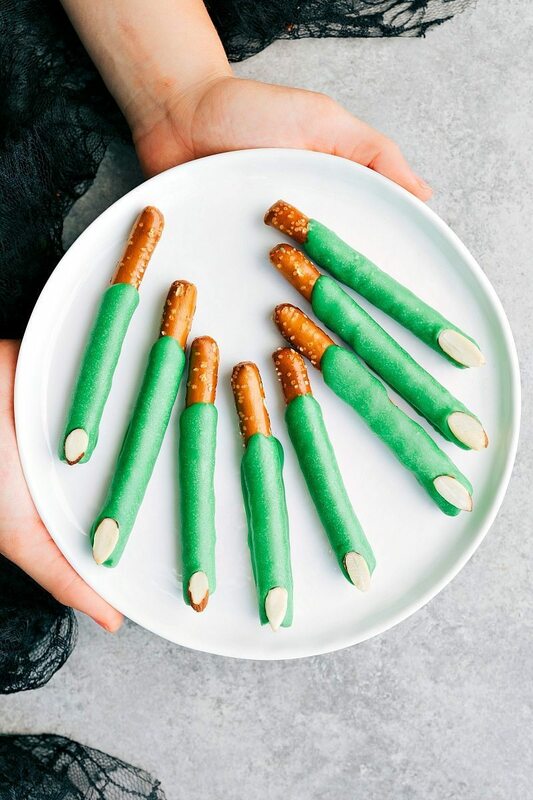 Add a sliced almond to the tip of the pretzel and allow for the pretzel rods to harden at room temperature. Yaaaaaas! 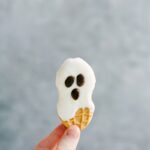 It gives me goosebumps to see bloggers come out with their Halloween recipes!! So cute and simple. 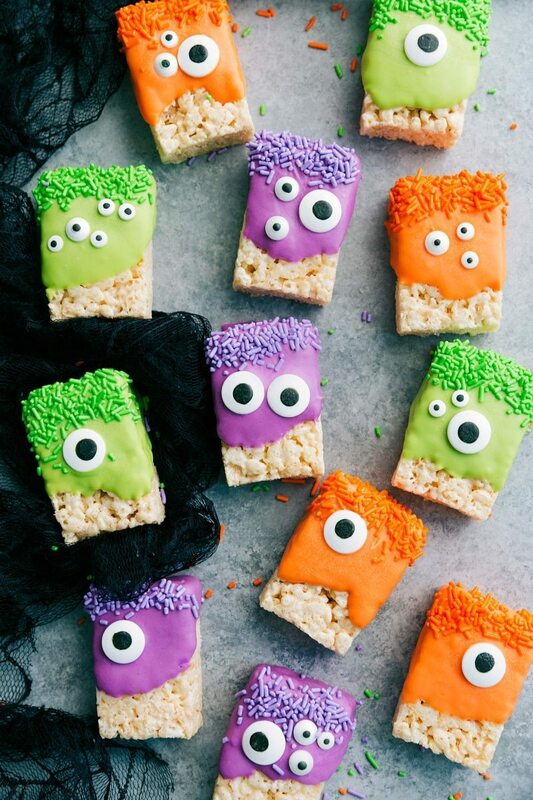 I love these Halloween Treats. I’ll be back for more!